Business leaders from Dorset Chamber of Commerce on a special visit to the Bournemouth and Poole College. 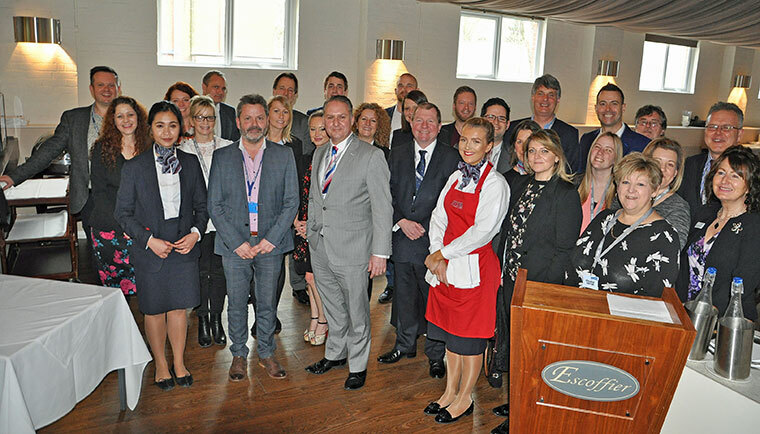 A delegation of Platinum Business Partners from Dorset Chamber of Commerce were given a behind-the-scenes look at the Lansdowne campus of Bournemouth and Poole College before a three-course lunch in the college’s fine dining restaurant Escoffier. Ian Girling, who is the Dorset Chamber of Commerce and Industry (DCCI) chief executive, stressed the importance of apprenticeships and building links between business and education. He said, “This was a superb visit, which really shone a light on the superb facilities which lie behind the college’s historic façade at Lansdowne. The College’s executive director of resources, Ken Roberts, led the tour, which included the hairdressing and beauty salons, library, gym and vocational facilities. The Chamber organised the visit as one of its special events for its Platinum Business Partners. Dorset Chamber has 29 Business Partners in its top tier of membership – including The College itself. The College, which provides further education – including apprenticeships and A levels for more than 11,000 people aged 16 to 18, has had £28 million invested in modern, state-of-the-art facilities. There is also a campus in North Road and at The Fulcrum in Poole. Dedicated centres have been launched for marine technology, financial services, care innovation and science, technology, engineering and maths (STEM), helping to fill skill gaps within industry. The Escoffier Restaurant is open for lunch to the public from Tuesday to Friday and for dinner Tuesday, Wednesday and Thursday during term time only. Visit www.dcci.co.uk and www.thecollege.co.uk for more details.